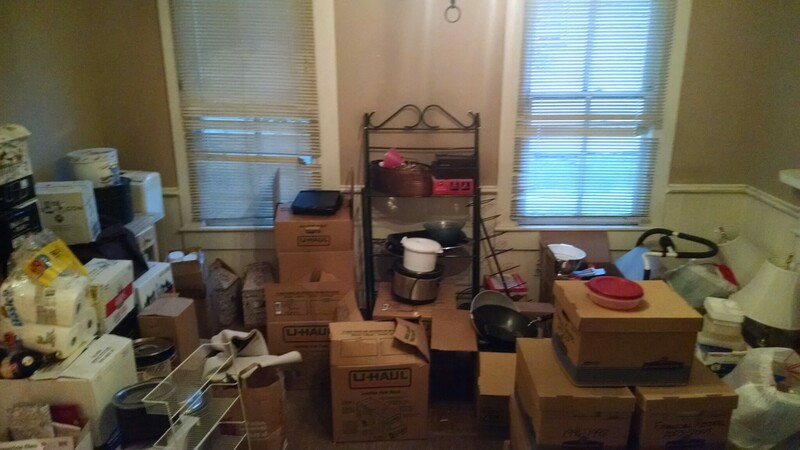 So, remember when I said the big move had happened and there were just a few things left at the rental to deal with? I’m so eating those words–can they at least be covered in chocolate sauce? Wine? Choco-vine?! We have spent the last month (with the exception of the weekend we were out of town for Ancient City Con) chipping away at those few loose ends at the rental. But on Tuesday I was able to hand in the keys and walk away from the property manager’s office with a spring in my step: no matter what, we are no longer under their thumb! Of course, it wasn’t exactly simple getting this far (again, is it ever?). Knowing we were seriously running out of time, each afternoon last week I was going to the rental on my way home, loading up my car with as much as could fit (mostly from the garage) and trucking it up to Thomasville to unload. Mostly onto the back porch because we lack the easy storage of a garage, here. More’s the pity. What the back porch currently looks like. Storage solutions are definitely needed! before we had everything except the cleaning supplies out of the rental. I met Lyssa at the house at 11 am and we didn’t end our day collapsed at home until after 6pm. Now, Todd might seem a little light on that list, but he’d gotten called into the office that morning, so missed the first run Lyssa and I made.Â Then the plan was that he was going to mow the grass while we made our second run, only to find out that running was the farthest thing from the lawnmower’s mind. Todd spent the majority of his day trying to get it to crank, achieved that, but couldn’t get it to stay on. So, tired, hot, and frustrated, we left the mower to sit and think about what it (hadn’t) done with the plan to try again Sunday. Three guesses how you think that went? Yeah, it wouldn’t run then, either, and Todd had tried every trick he knew. So we concentrated on cleaning the rest of the house (the hall bathroom, the tile flooring, and the kitchen) and still didn’t get done until after 6pm. 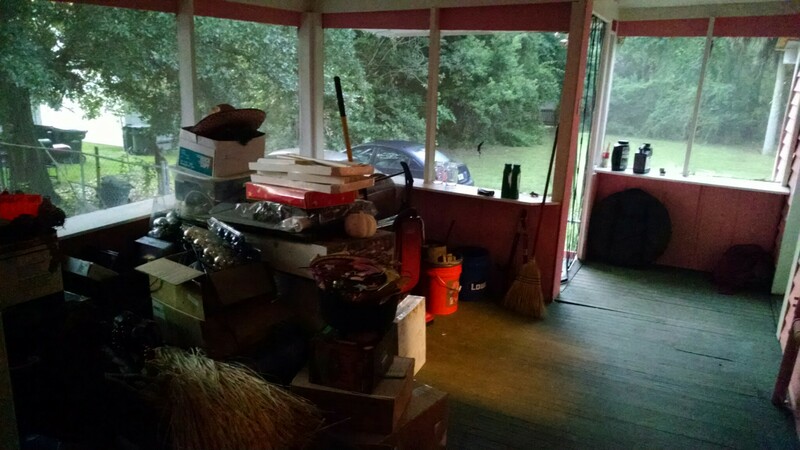 This left two areas to address: the lawn and the living room carpet. We ended up being able to borrow a lawn mower Monday night and Todd mowed until near-dark, not getting home until 9pm. Meanwhile, I met the carpet guy for round 2 of cleaning Monday afternoon. The property manager requires you get the carpet steam cleaned by a pro and provide a receipt. I’d found a Living Social deal for $69.95 that would cover up to 5 rooms and a hallway. We only had 3 carpeted rooms and it was the first deal to come along in a while for carpets, so I snatched it up and made the appointment for mid-month. Unfortunately, after 3.5 years of wear on top of not being great carpet to begin with (and us never moving the furniture to see the extent of the “traffic patterns”) there were some stains to deal with and some scrubbing to do. To the tune of an addition $150! Knowing we’d just get dinged for it after the fact, I went ahead and signed the quote and paid for the service by phone when it was done. Yeah, I’m definitely going to need that detailed invoice because there’s no way the property manager is going to believe I spent over $200 for that! My ireÂ was vindicated, though, on Monday when the owner came to try and fix the mess and agreed that it looked like his worker-bee hadn’t finished the job for some reason unbeknownst to us all (an aberration, he assured me, especially for that employee). An hour and a bit later he’d scrubbed and steamed that carpet into much better shape. The stains were gone and the traffic patterns were much improved. He said it’d take replacing the pad underneath to get the rest out, but that’s for the property owner to decide to do or not. So, if anyone in the Tallahassee area is looking for conscientious carpet cleaning, I heartily recommend J&A Restoration. He could have just as easily told me it was too bad, there wasn’t anything he could do, I’d already paid and it was too late, but he was adamant about getting a chance to make it good and he did. Thank you, Josh! The library is really our toss-room at the moment. 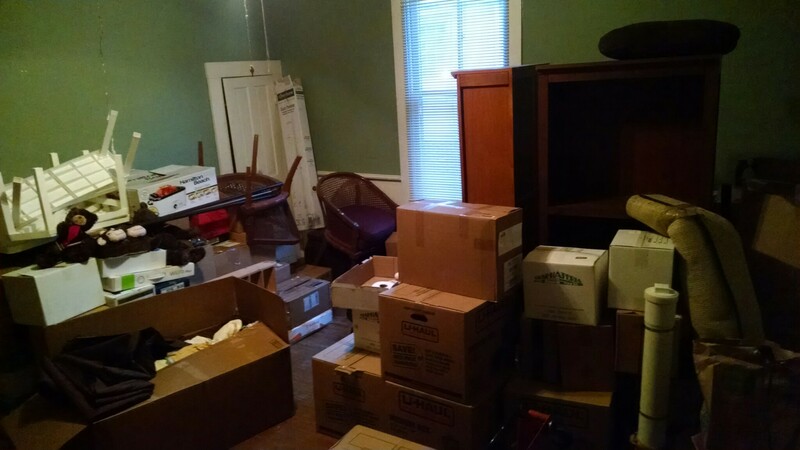 It also has our dining room set in the corner off to the right that we can’t exactly get to at the moment. The dining room is holding most of the kitchen stuff that we can’t unpack until I give the lower cabinetsÂ a coat of Kilz and some new liners. But first, the weekend off that I promised myself. I’m going to have a mani-pedi I’ve been putting off for too long then go to lunch with a friend I see not nearly enough. After that I have some quality time with art supplies lined up. I really hope Todd will take advantage of the downtime as well. The to-do list is looming but the worst it can do is give him a paper cut! It’s a Great Day to Set Some Public Goals!